Hey Ananka! I put a new post on my blog check it out! ps why is Iris never mentioned in your blog? Iris plays a big role in the next book, so don't worry about her! thank u so much for publisizing my blog! By the way, how do u invite team members to your blog? I'm afraid don't really know . . . anyone else have an answer? No. I'm just reading what you guys say. 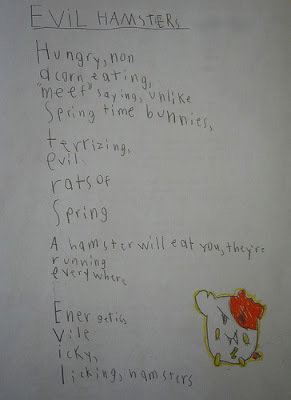 The answer is the first letter of every line, and it spells out, hamsters are evil. Oh! Iris is important in Kiki Strike: The Empress's Tomb. I'll have to remember that.